First start with preparing the artichokes, which isn’t so complicated as you may think. 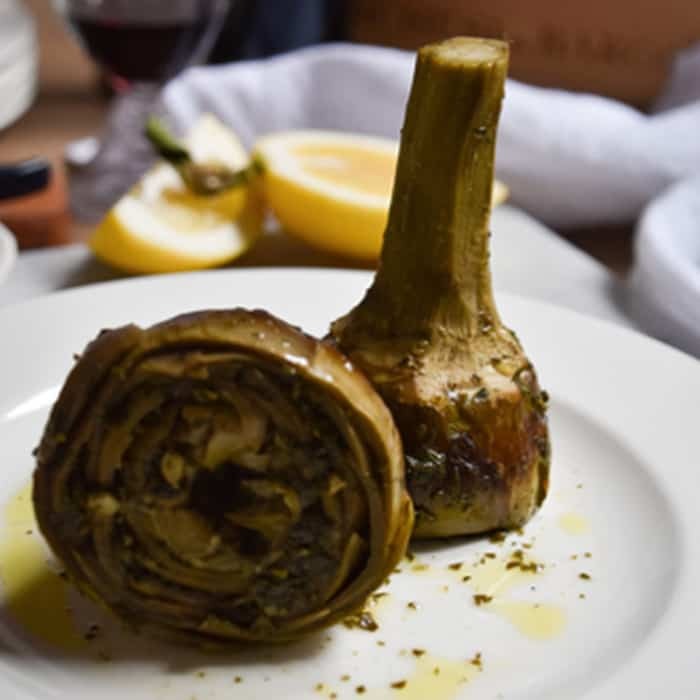 Start by taking an artichoke in one hand, leaving the stalk on ( I think it looks better that way plus stalks have a lot of flavour ). Snap off and discard all outer leaves while turning the artichokes, stop when you get down to more tender and paler leaves. Next, with a small sharp knife peel off the stringy outside of the stalks and work around the top of the stalk and the base of the artichoke, trimming and scraping away the base while turning the artichoke. Finally trim off the pointed tops of the remaining leaves, you should create a flat surface ( to cook the artichokes you need to put them into a pot, head down with and stalks up). Then use a teaspoon to scoop out and discard the hairy choke from each artichoke centre. To prevent the artichokes from discolouring prepare a large bowl filled up with cold water and add the lemon juice. I like to rub some more lemon juice on individual artichokes (with the pieces of lemon) before placing them into the bowl with the water. Now combine the chopped herbs with salt, pepper and garlic, then add some olive oil to turn the mixture into a paste . Take the artichokes out of water and drain them. Now it is time for the chopped herbs filling that needs to be equally divided and rubbed in between the leaves of the artichokes. You can help yourself by gently separating the leaves with your fingers, pushing the herb mix in between them. You will need a rather tall pot for cooking. Place the artichokes inside it, head down and stalks up. If the stalks are too long for the height of the pot ( you cook them with a lid on), just trim the tops off. Pour over the oil and water, put the lid on and simmer for about 40 minutes. Younger or baby artichokes will need less time. You can check if they are ready with a small sharp knife, they should be soft and give no resistance to the blade. You can serve them on a plate either the same way as you cooked them or lay them flat. Add some cooking juices and couple of drops of lemon juice according to your taste.